How is your life at this moment? What is reflected in your personal movie; you like all the images or there are some that you do not like and you want to change. What are you currently seeing in your life, whether you like it or not, accept it or not, understand it or not, you are creating it through your vibration? On one level we can say that we are energy, waves (quarks and electrons), therefore we have a frequency of vibration and we attract everything in our life by vibrational resonance. According to our vibration, we attract prosperity or scarcity. Or I live from the love that is the energy of higher vibration or lives from fear, the lowest vibration. All other emotions are derived from these 2. How to know what frequency I am vibrating? We recognize if we are in a vibrational or another state through what we feel. Your thoughts or beliefs generate emotions, in other words, your emotions are a reflection of your thoughts. You can begin to raise your vibration by making small changes, actions performed consistently to experience thoughts, emotions or positive physical states. Keyword, CONSISTENCY (duration, stability, soundness). If you want to see significant changes it is important that you are willing to pay the price, in this case, it is to invest time in these activities on a daily basis. This is an important commitment to you, avoid breaking it, it is worth it to achieve a high vibration and improve various aspects of your life. 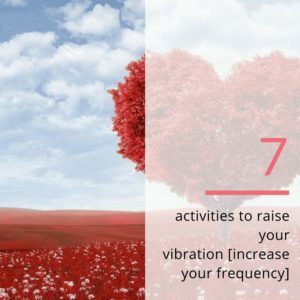 7 activities to raise your vibration or to vibrate from love so you can vibrate at high frequencies. The mind seems to be leaning towards negativity. She is always active, talking to us and usually leading us to think about difficult scenarios, worries, fear, scarcity. The mental noise is constant. If we already know that we attract situations according to how we vibrate, keep in mind that if you let this kind of thoughts run, they will produce low vibration emotions that will attract just what you do not want. Propose to be more aware of the quality of what you think and if you come unpleasant thoughts do not hook or fight against them, accept them, thank them and practice the second activity of the list. When you discover yourself thinking of fear or negatively, use this technique to stop your mind and raise the quality of your thoughts. And what is Ho’oponopono? It is a technique of Hawaiian origin that is used for the resolution of conflicts and that means amending or correcting an error. It is practiced to erase negative programming, your ancestral memories and that the right or perfect comes to your life. It consists, in a very basic way, in repeating some words that are like a mantra and that is what the work of erasing is doing. 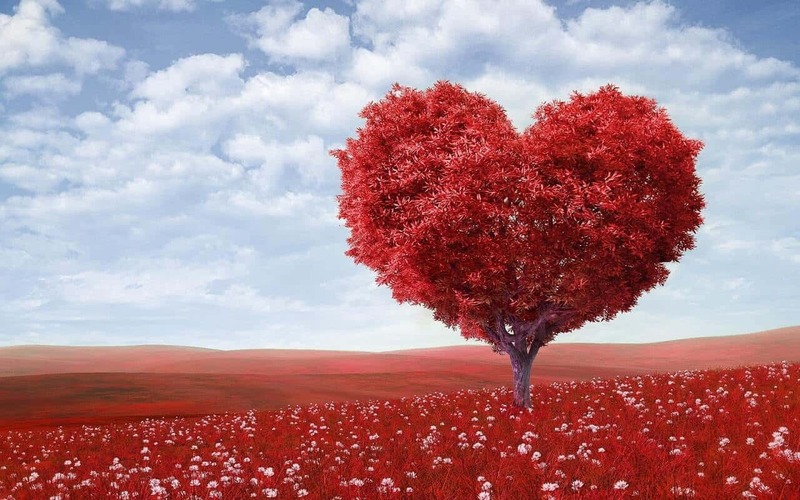 “I’m sorry, forgive me, I love you and thank you.” This can be said mentally, it is not necessary to speak it, yes, repeat it as many times as you can. Take advantage of some routine tasks, while cleaning or ordering or if you have to wait at an appointment. The Ho’oponopono helps raise the vibration. Everything that is in lower vibrations begins to be cleansed of the subconscious mind that is the one that archives the beliefs and memories of each person. Beliefs are those thoughts that you have told so many times that they have already become true for you; many of them are highly limiting. Remember that you believe what you believe in. The memories are all the influences of your ancestors, among which are traumas and emotional blocks that are transferred from one generation to another, as repetitive patterns. You want to know more about Ho’oponopono I leave here some links: Ho’oponopono site and video. If you have read other posts on this blog you will see that this topic is recurrent. The insistence on this invitation is for the simple and beneficial that is to be grateful. This focuses us on what we have, even if it is very little, instead of what we need. It connects us with the state of abundance that exists in our life and that many times, we do not recognize. Count your blessings daily. Each morning thanks for 3 things you enjoy in your life. Starting, the dawn alive is already an important reason to thank. Repeat the same dose when you lie down, before going to sleep. Click here to see a video of Dr. Robert Emmons, professor of psychology at UC Davis in California, a researcher on the effects of gratitude. This post provides you many things to be grateful for. Dance can help us release or drain negative emotions, it also sets us in motion generating a sense of joy. As an exercise, it helps us to release endorphins, a chemical produced by the body that can relieve stress and increase pleasure. If dancing is not your thing then listen to music that you feel good about. Please be very selective at this point so that you really choose the one with which you detect that you have a surge of energy and courage. I took a laugh therapy course and when we talk about the positive effects of laughter it is amazing what this simple practice can do in our body chemistry. As children, we are natural optimists, even a small sick person smiles. Children laugh about 300 times a day and the average adult only about 20 or 30. Let’s incorporate laughter daily. Do not expect someone to make us laugh. We can look for personal sources of laughter. The idea is to laugh for no reason, however, we have conditions that may make this task difficult. So if you need a source or help at the beginning, do it and laugh as many times as you can. Program even if it’s about 5 minutes a day of laughter. When you really laugh, you can not even think. With that, we also appeased our talkative mind. Something I learned is that laughing with each vowel gives us different benefits. So ha, ha, ha, ha, ha. Especially hu, hu, hu, hu (I’ll explain that in another post). 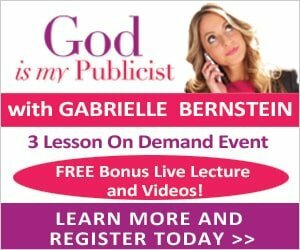 I took a laughter therapy workshop with Menahem Belilty, an expert in laughter therapy, and it has been one of the most fun and rewarding experiences. Click here. This is a clean link (in Spanish) without any affiliation. You can also search other sources. In another post, we talked about the affirmations and the positive impact they can have. If you also make pleasing visualizations you double their power. Visualizing is like daydreaming in this case, the particular condition is that it be in pleasant things for us. To start you can think of something you really enjoy, something that you really love. Close your eyes and imagine that you are reliving that situation. With a few minutes a day that you dedicate to this action, you will feel how your mind and body change in tune. 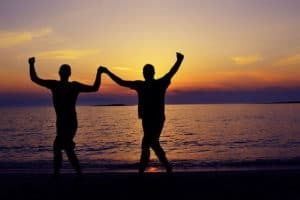 If it is difficult for you to imagine, look for some guided visualization so that at the beginning it helps you to connect with these mental images. We all have imagination, it is a natural resource that we can take advantage of more in our favor. The word also creates, edifies and destroys. They say that a lie told many times becomes a truth, a self-fulfilling prophecy. Just as we begin by suggesting that we take care of our thoughts, we make an equivalent effort with our words. Almost without realizing our mouth, many expressions come out in negative, harsh criticism for us and others, complaints, curses, very offensive comments, judgments that knock. With such negative and daily verbiage, it is impossible to think that we are going to feel good. Here it is also worth mentioning Mr. Miguel Ruiz and his Four Agreements, be impeccable with your words. When I attack others with my words, I attack myself because the hatred or resentment I saw through them will somehow turn against me. Being impeccable, he defines it as using words with wisdom to contribute something positive, to show love and not to offend or hurt. It is to use them on our behalf. Practice this not only with the words you say and say to others but with the ones you say to yourself. You are ready to vibrate with love. We shared with you a list of activities to raise your vibration fast. Take from here what works best for you. Do it daily. Maybe 7 things at once are too much, go step by step getting used to each one and enjoying its effects on you. Question what you want to question, you are in your right, in fact, it is good to do it, but do the test because it is worth vibrating from love. Do you want to read this post in Spanish? Here is. If you like this post, our biggest reward is that you share 7 activities to raise your vibration [increase your frequency] or subscribe to our blog. Thank you!